For Sponsoring The Ignition Awards! 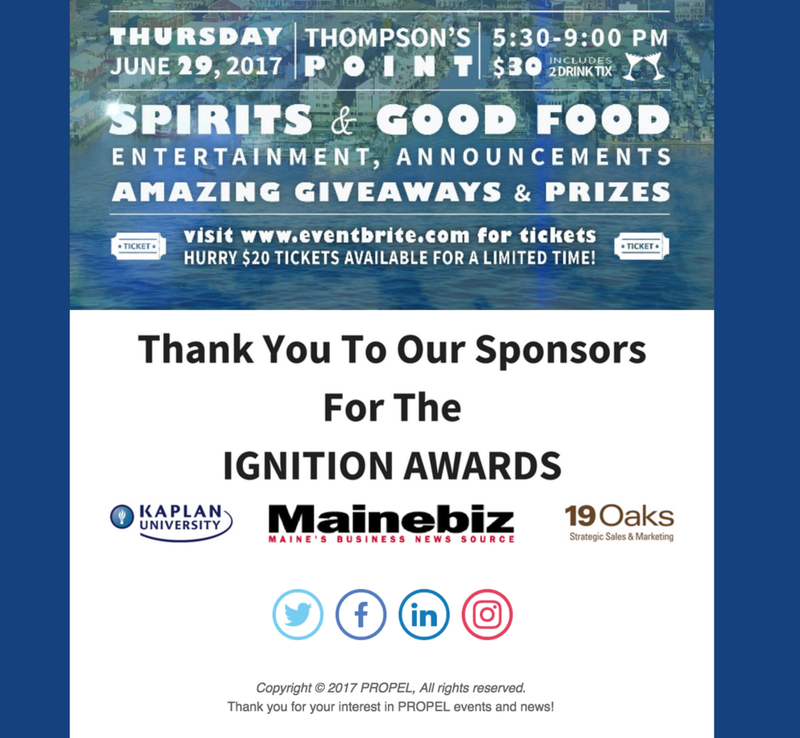 Thanks to the generous sponsorship provided by WEX, PROPEL was able to sell over 250 tickets to the 2nd Annual Ignition Awards. This event served as the kick off to an annual platform that PROPEL will use to unite the young professionals of Portland in celebrating the small and large businesses that make our city such a fantastic place to network, develop and live. From the entire PROPEL Board, thank you for being a part of the Ignition Awards! Below you'll find a short outline of the PROPEL provided WEX through promoting the event, and the event itself! 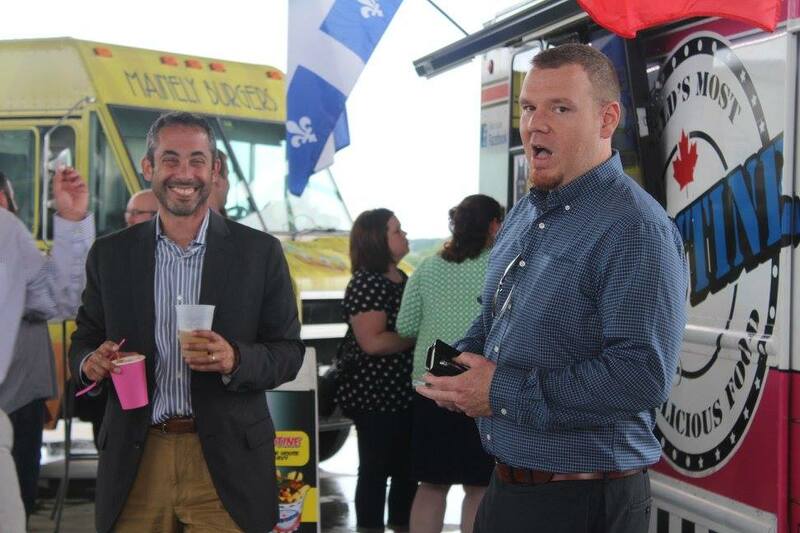 The Kaplan logo was featured on or programs, which not only informed attendees about the event schedule, but were also the vehicle attendees used to submit their votes for the Food Truck of the Year! The Kaplan logo was featured prominently on the Partners section of our slideshow which ran on all TV's throughout the event. The Kaplan logo was featured in 7 email blasts sent to the PROPEL email list, past entreverge attendees, sponsors, and nominees. The ideal dimensions for this ad would be would be one 750 X 275 image. We are happy to provide 5 more posts/ shares - These could take the form of PROPEL sharing specific Kaplan Facebook posts with our audience, or posts made by the PROPEL page with the content provided by Kaplan. The copy for these posts can vary in length, but posts with less than 80 characters receive 66% higher engagement than posts with more than 80 characters. Please provide one related image for each post that you would like made from the PROPEL page (no specific dimensions required but we find that landscape photos work best). Please provide direction on which events/ posts you would like to be shared a minimum of 48 hours before you would like them shared. Preferred image dimensions are 1191 X 537 (similar to the image provided for "This is IT Working" but we have some flexibility, as we do with the copy. We generally prefer to not have more than 600 characters describing one item in an email. Please allow up to 2.5 weeks for dedicated email sends so that we can coordinate with other scheduled emails. We will likely include at least 1 PROPEL topic in this email so that it seems less "salesy". Please send us the requested materials when you are able. We look forward to working with Kaplan to help young professionals thrive in our beautiful city!